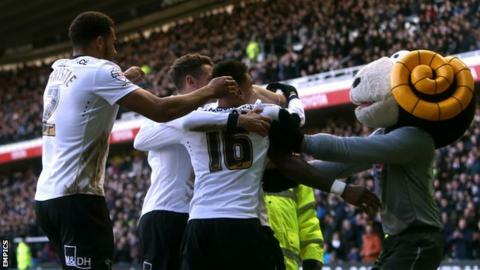 Darren Bent's penalty gave Derby a thrilling win over Sheffield Wednesday and sent them top of the Championship. Lewis McGugan put the Owls into the lead with a superb curling free-kick, before Jake Buxton glanced home the equaliser from George Thorne's corner. Will Keane pounced on slack Derby play to fire home for 2-1, but Buxton nodded home another leveller from a corner. Bent converted a spot-kick after Owls goalkeeper Keiren Westwood was sent off for hauling down Tom Ince in the area. Derby were hoping to capitalise on morning leaders Middlesbrough's 1-0 defeat by Leeds earlier in the day and named midfielder Thorne in the starting line-up for the first time this season. Thorne - a summer signing from West Bromwich Albion - had been kept on the sidelines by a pre-season cruciate ligament injury. Before Saturday's game at Derby, Sheffield Wednesday had only conceded one goal from a corner this season. But his side fell behind after Will Hughes gave away a soft free-kick on the edge of his own area and McGugan's effort looped over the wall, leaving goalkeeper Lee Grant rooted to his spot. Ince then missed a glorious chance to level, but the on-loan winger could only hit the post with the goal at his mercy, before later seeing a free-kick brilliantly tipped over by Westwood. McGugan's goal failed to give Wednesday a foothold in the game, and a minute after the break Steve McClaren's side were level when defender Buxton rose to turn in. Soon after, Derby gave the ball away cheaply and forward Keane, who is on loan from Manchester United, took full advantage to beat Grant at the near post. Stuart Gray's side had Derby in trouble, and Kieran Lee sliced an effort from Jacques Maghoma's cross when well placed in the area. Wednesday looked vulnerable at corners and Derby made in 2-2 when Craig Bryson's ball in was headed in by Buxton for his third goal of the season. Ince then curled an effort just wide, before he won the penalty from which Derby moved two points clear at the top of the table after Brentford beat Bournemouth 3-1. "We've had spells of six or seven clean sheets but in the last four we've conceded nine goals. "We can't continue with that and I thought today we are going through a spell where we make a mistake or give a free-kick away and it's a goal. "But we have to eradicate mistakes otherwise conceding nine goals in the next four games will get us nowhere. "We said to the players at half-time that this could be a very big three points if we comeback and I think in the end we wore Wednesday down with constant pressure and the tempo of our football." "We have been doing very well in our own box so to concede three goals from set plays was very disappointing. And then for Westwood to get sent off, I think that was a bit harsh. "Derby are a good side and I think they will get promoted. Because they put you under so much pressure, we have got lads making decisions with tired minds. "But to get ourselves 2-1 up gave us something to build on." Match ends, Derby County 3, Sheffield Wednesday 2. Second Half ends, Derby County 3, Sheffield Wednesday 2. Hand ball by Chris Maguire (Sheffield Wednesday). Attempt saved. Craig Bryson (Derby County) right footed shot from the left side of the box is saved in the centre of the goal. Assisted by Craig Forsyth. Attempt missed. Tom Ince (Derby County) left footed shot from the centre of the box is too high. Attempt missed. Jeremy Helan (Sheffield Wednesday) left footed shot from outside the box misses to the right. Assisted by Atdhe Nuhiu. Attempt saved. Jesse Lingard (Derby County) right footed shot from the left side of the box is saved in the centre of the goal. Assisted by Craig Bryson. Jesse Lingard (Derby County) wins a free kick in the attacking half. Goal! Derby County 3, Sheffield Wednesday 2. Darren Bent (Derby County) converts the penalty with a right footed shot to the bottom left corner. Substitution, Sheffield Wednesday. Chris Kirkland replaces Sam Hutchinson. Penalty Derby County. Tom Ince draws a foul in the penalty area. Penalty conceded by Keiren Westwood (Sheffield Wednesday) after a foul in the penalty area. Keiren Westwood (Sheffield Wednesday) is shown the red card. Attempt missed. Tom Ince (Derby County) left footed shot from the right side of the box misses to the left. Assisted by Jesse Lingard. Substitution, Sheffield Wednesday. Joe Mattock replaces Will Keane. Attempt missed. Sam Hutchinson (Sheffield Wednesday) right footed shot from outside the box is close, but misses to the left. Assisted by Lewis McGugan. Chris Maguire (Sheffield Wednesday) wins a free kick in the defensive half. Corner, Derby County. Conceded by Tom Lees. Corner, Derby County. Conceded by Liam Palmer. Goal! Derby County 2, Sheffield Wednesday 2. Jake Buxton (Derby County) header from the left side of the six yard box to the bottom left corner. Assisted by Craig Bryson with a cross following a corner. Attempt blocked. Jesse Lingard (Derby County) right footed shot from the left side of the box is blocked. Assisted by Jake Buxton. Corner, Derby County. Conceded by Kamil Zayatte. Attempt blocked. Tom Ince (Derby County) left footed shot from the left side of the box is blocked. Assisted by Will Hughes.